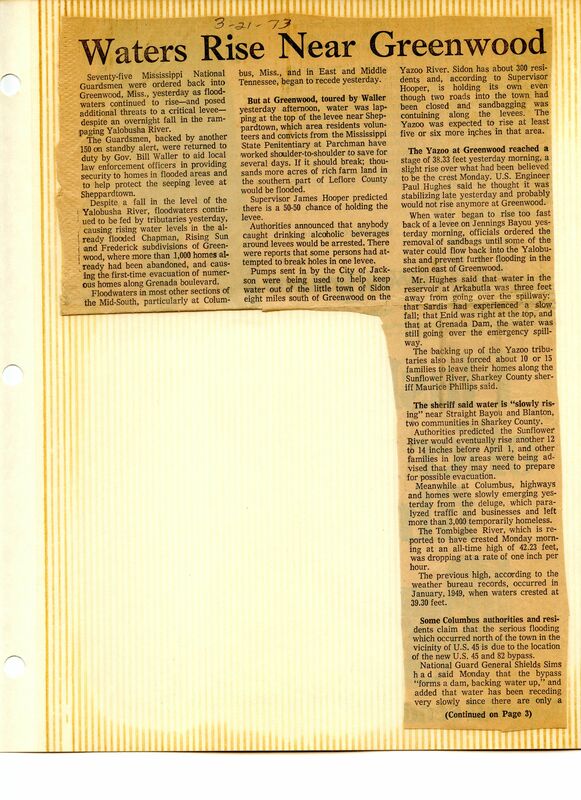 “Two years later (1973) the county was again declared a major disaster area when what they called a ‘100 year flood’ covered the county and did millions of dollars damage. Many houses just outside of Greenwood to the north and south were in water up to their eaves, and a good part of the farm land was under water. I would ride around with the supervisors in their pickups to view the situation and one day rode the levees with the U.S. Engineer Paul Hughes. Since they were worried about Greenwood proper they decided to put a fence around the whole town [on top of the levees]. Jane Biggers at the Commonwealth suggested that people paint designs on the fences, so they ended up with all this colorful artwork on them. I wonder if the engineers have ever done something like that, the building of all those fences, anywhere else before or since. It really seemed like a big waste of money. “But I got scared one Saturday morning when I was at a meeting with some of the top engineers from Vicksburg and one of them said a four inch rain might get North Greenwood, and the clouds were already building up. I came home and got all of my photographs, which were stored in a low cabinet, and put them in a higher spot. I guess the pictures were all I planned to save, but I had always said in case of a fire I would grab those first. 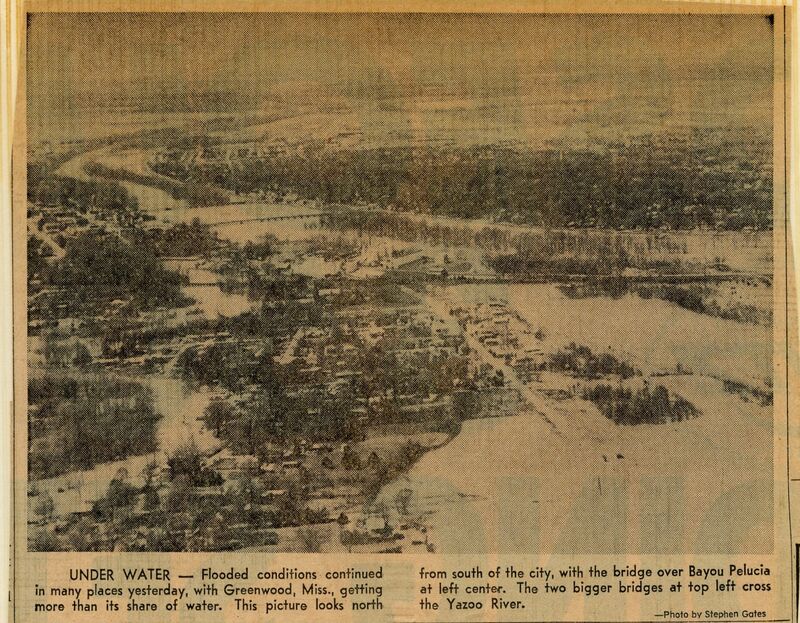 I was in college when the waters rose across the Delta in 1973, and I was really oblivious to what Sara was telling me about this slowly developing disaster. I had no idea just how bad it was until I tried to get home from Clinton one weekend. Russell had sketched me a roundabout route which would take me through Jackson, up I-55 and down to Greenwood through Vaiden and Carrollton. Being a cocky 19-year-old know-it-all, I ignored his paternal advice and came barreling right up Highway 49, which was just fine until somewhere around Cruger. At that point, the roadside lakes which had replaced the familiar cotton fields merged in the middle of the highway and I was skidding along with no clear sign of where road ended and fields began. And it wasn’t much better in Greenwood, where the Yazoo seemed to be ready to leap right across Front Street and down Howard. Needless to say, my return route was what Russell had recommended all along. And the plywood “fence.” Good heavens, what were they thinking? That was a notorious eyesore for what seemed like decades, although I’m sure it stood for only a few years. It might have kept the water back for a few hours, if that, but it was certainly not a reassuring structure. 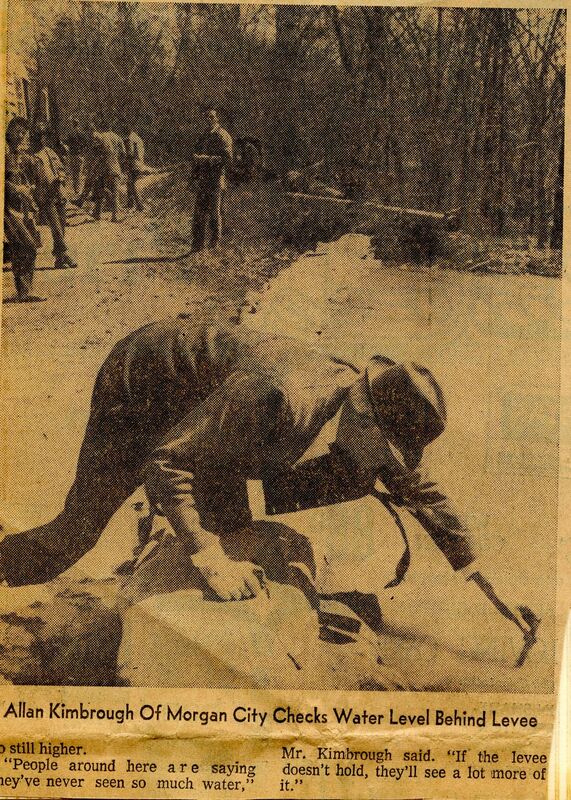 Sara thought it was one of the most hideous insults to ever descend on Greenwood, and it didn’t help that her old newspaper nemesis, Jane Biggers, promoted the idea of painting the panels. This is another time I remember vividly. I was attending MDJC and lived on campus. We slogged to class for days in rain. Someone came in our dorm room and told us that places were flooding in the Delta. It really didn’t hit home until I went to Greenwood for the weekend. My dad and brother had driven around and taken slides of the flooding. The homes on Highway 7 going toward Grenada were totally flooded to the rooftops. Men were in fishing boats checking things out. The Yazoo River was nearly touching the Keesler Bridge. I viewed those slides a few years ago and was reminded of the damage. Today things are fine, but then it was a mess. 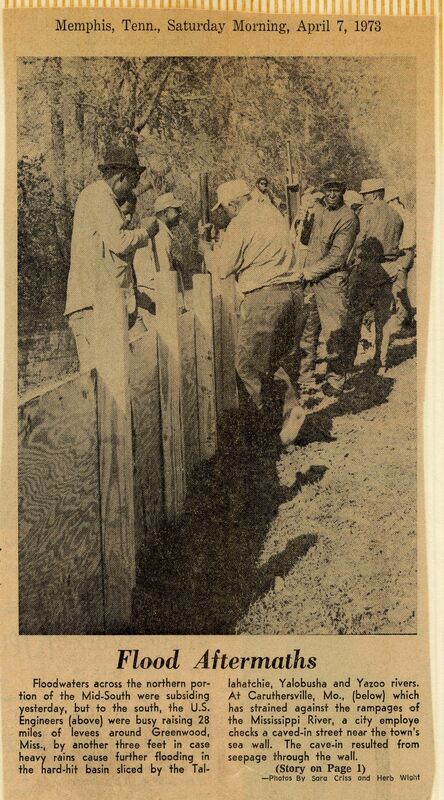 I also remember those ugly plywood fences on the levee. That was not even practical. I was so glad when those came down.